Download "SECTION A OFFICIAL EVENTS"
1 1 The Official Special Olympics Sports Rules for Floorball shall govern all Special Olympics competitions. 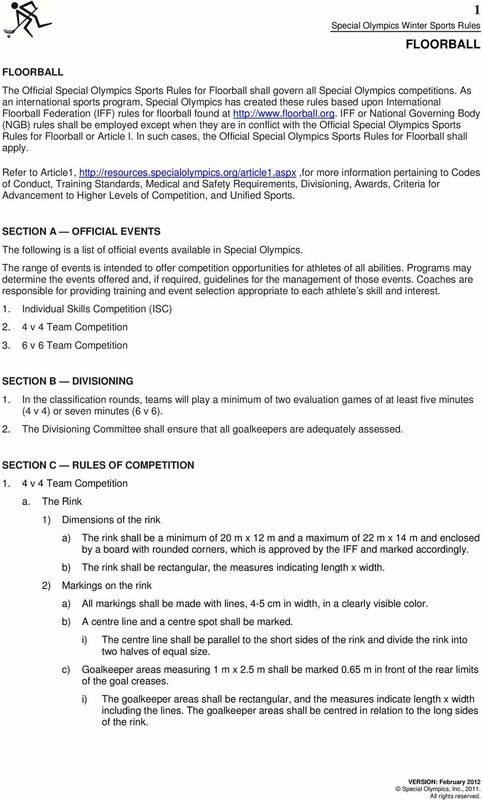 As an international sports program, Special Olympics has created these rules based upon International Floorball Federation (IFF) rules for floorball found at IFF or National Governing Body (NGB) rules shall be employed except when they are in conflict with the Official Special Olympics Sports Rules for Floorball or Article I. In such cases, the Official Special Olympics Sports Rules for Floorball shall apply. Refer to Article1, more information pertaining to Codes of Conduct, Training Standards, Medical and Safety Requirements, Divisioning, Awards, Criteria for Advancement to Higher Levels of Competition, and Unified Sports. SECTION A OFFICIAL EVENTS The following is a list of official events available in Special Olympics. The range of events is intended to offer competition opportunities for athletes of all abilities. Programs may determine the events offered and, if required, guidelines for the management of those events. Coaches are responsible for providing training and event selection appropriate to each athlete s skill and interest. 1. Individual Skills Competition (ISC) 2. 4 v 4 Team Competition 3. 6 v 6 Team Competition SECTION B DIVISIONING 1. In the classification rounds, teams will play a minimum of two evaluation games of at least five minutes (4 v 4) or seven minutes (6 v 6). 2. The Divisioning Committee shall ensure that all goalkeepers are adequately assessed. SECTION C RULES OF COMPETITION 1. 4 v 4 Team Competition a. The Rink 1) Dimensions of the rink a) The rink shall be a minimum of 20 m x 12 m and a maximum of 22 m x 14 m and enclosed by a board with rounded corners, which is approved by the IFF and marked accordingly. b) The rink shall be rectangular, the measures indicating length x width. 2) Markings on the rink a) All markings shall be made with lines, 4-5 cm in width, in a clearly visible color. b) A centre line and a centre spot shall be marked. i) The centre line shall be parallel to the short sides of the rink and divide the rink into two halves of equal size. c) Goalkeeper areas measuring 1 m x 2.5 m shall be marked 0.65 m in front of the rear limits of the goal creases. i) The goalkeeper areas shall be rectangular, and the measures indicate length x width including the lines. The goalkeeper areas shall be centred in relation to the long sides of the rink. 2 2 d) The rear lines of the goalkeeper areas shall also serve as goal lines. Marks for the goal posts shall be made on the rear lines of the goalkeeper areas, so that the distance between the marks is 1.6 m. i) The goal lines shall be centred in relation to the long sides of the rink. The marks for the goal posts shall be made either with interruptions in the rear lines of the ii) goalkeeper area or with short lines, perpendicular to the rear lines of the goalkeeper area. e) Face-off dots shall be marked on the centre line and on the imaginary extensions of the goal lines, 1m from the long sides of the rink. i) The face-off dots shall be marked as crosses. The dots on the centre line may be imaginary. 3) Goal cages a) Goal cages, approved by the IFF and marked accordingly, shall be placed with the posts on the prescribed marks. b) The dimensions of the goal shall be 160 cm x 115 cm x 60 cm. c) The openings of the goal cages shall face the centre spot. 4) Substitution zones a) Substitution zones with a length of 5 m shall be marked along one of the long sides of the rink; 5 m from the centre line, and include players benches. b) The substitution zones shall be marked on both sides of the board. The width of the substitution zones must not exceed 3 m, measured from the board. The players benches shall be placed at an appropriate distance from the board and have sufficient room for all members of team not on court, including coaches. 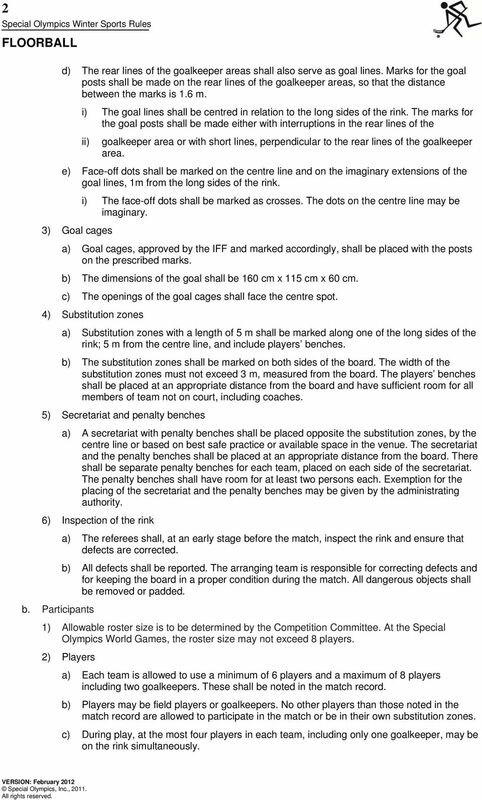 5) Secretariat and penalty benches a) A secretariat with penalty benches shall be placed opposite the substitution zones, by the centre line or based on best safe practice or available space in the venue. The secretariat and the penalty benches shall be placed at an appropriate distance from the board. There shall be separate penalty benches for each team, placed on each side of the secretariat. The penalty benches shall have room for at least two persons each. Exemption for the placing of the secretariat and the penalty benches may be given by the administrating authority. 6) Inspection of the rink a) The referees shall, at an early stage before the match, inspect the rink and ensure that defects are corrected. b) All defects shall be reported. The arranging team is responsible for correcting defects and for keeping the board in a proper condition during the match. All dangerous objects shall be removed or padded. b. Participants 1) Allowable roster size is to be determined by the Competition Committee. At the Special Olympics World Games, the roster size may not exceed 8 players. 2) Players a) Each team is allowed to use a minimum of 6 players and a maximum of 8 players including two goalkeepers. These shall be noted in the match record. b) Players may be field players or goalkeepers. No other players than those noted in the match record are allowed to participate in the match or be in their own substitution zones. c) During play, at the most four players in each team, including only one goalkeeper, may be on the rink simultaneously. 3 3 d) For the referees to start a match, each team shall have at least three field players and a properly equipped goalkeeper, or the final score shall be 3-0 to the non-offending team. During play, each team must be able to play with at least three players, or the match shall be stopped and the final score shall be 3-0 to the non-offending team, or the achieved result if this is more advantageous for the non-offending team. 3) Substitution of players a) Substitution of players may take place at any time and an unlimited number of times during a match. b) All substitution shall take place in the team s own substitution zone. A player leaving the rink has to be on his way passing over the board before a substitute may enter the rink. An injured player leaving the rink outside his own substitution zone must not be replaced until play is interrupted. 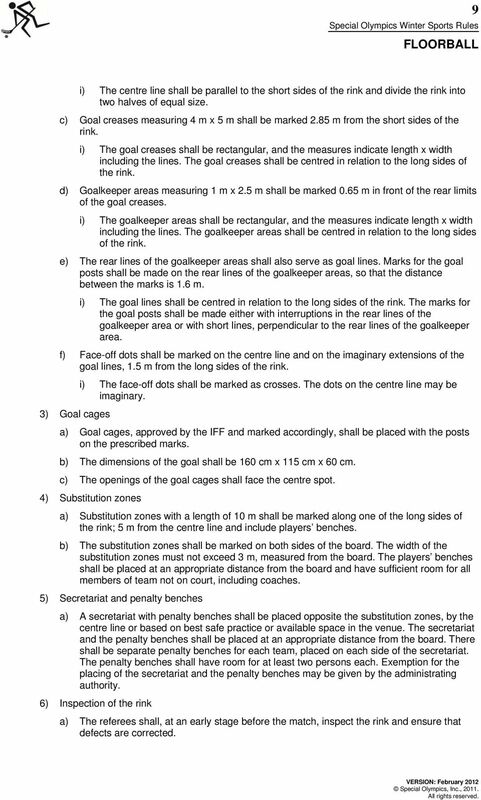 4) Particular regulations for goalkeepers a) All goalkeepers shall be marked in the match record. b) The marking shall be made with a "G" in the margin. A player marked as goalkeeper must not participate as a field player, with a stick, during the same match. 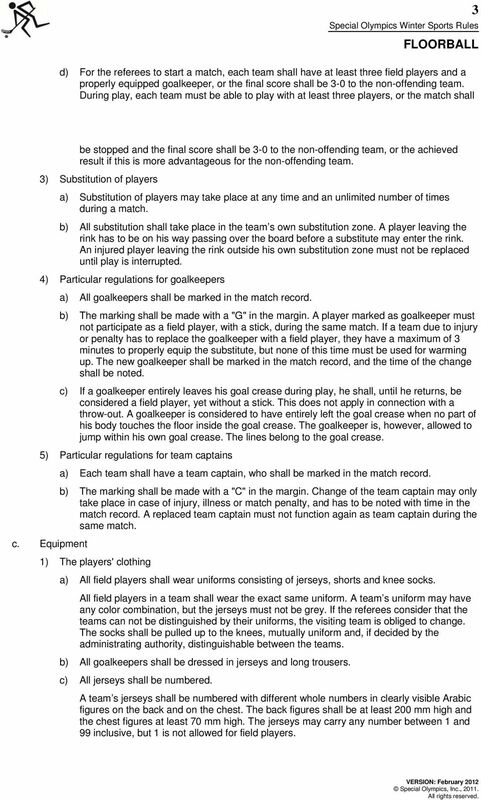 If a team due to injury or penalty has to replace the goalkeeper with a field player, they have a maximum of 3 minutes to properly equip the substitute, but none of this time must be used for warming up. The new goalkeeper shall be marked in the match record, and the time of the change shall be noted. c) If a goalkeeper entirely leaves his goal crease during play, he shall, until he returns, be considered a field player, yet without a stick. This does not apply in connection with a throw-out. A goalkeeper is considered to have entirely left the goal crease when no part of his body touches the floor inside the goal crease. The goalkeeper is, however, allowed to jump within his own goal crease. The lines belong to the goal crease. 5) Particular regulations for team captains c. Equipment a) Each team shall have a team captain, who shall be marked in the match record. b) The marking shall be made with a "C" in the margin. Change of the team captain may only take place in case of injury, illness or match penalty, and has to be noted with time in the match record. A replaced team captain must not function again as team captain during the same match. 1) The players' clothing a) All field players shall wear uniforms consisting of jerseys, shorts and knee socks. All field players in a team shall wear the exact same uniform. A team s uniform may have any color combination, but the jerseys must not be grey. If the referees consider that the teams can not be distinguished by their uniforms, the visiting team is obliged to change. The socks shall be pulled up to the knees, mutually uniform and, if decided by the administrating authority, distinguishable between the teams. b) All goalkeepers shall be dressed in jerseys and long trousers. c) All jerseys shall be numbered. A team s jerseys shall be numbered with different whole numbers in clearly visible Arabic figures on the back and on the chest. The back figures shall be at least 200 mm high and the chest figures at least 70 mm high. The jerseys may carry any number between 1 and 99 inclusive, but 1 is not allowed for field players. 4 4 d) All players shall wear shoes. The shoes shall be of an indoor sports model. Socks outside the shoes are not allowed. If a player loses one or both shoes during play, he may continue playing until the next interruption. 2) The referees' clothing a) The referees shall wear jerseys, black shorts and black knee socks. The referees shall wear the same color combination on their uniform. 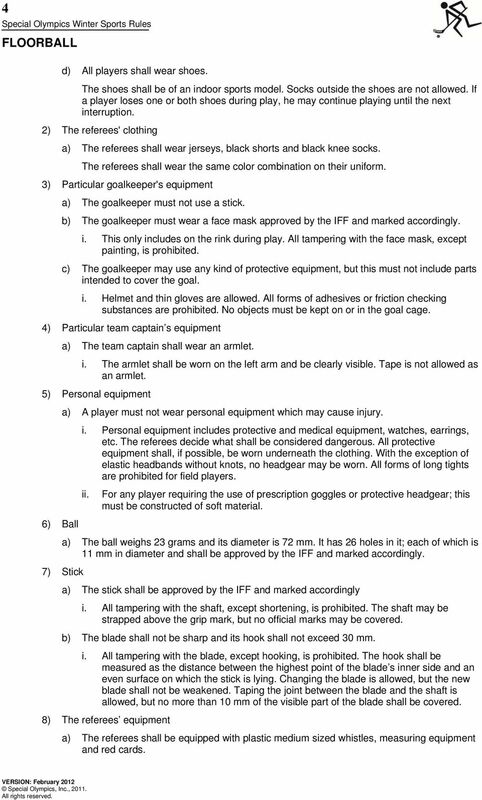 3) Particular goalkeeper's equipment a) The goalkeeper must not use a stick. b) The goalkeeper must wear a face mask approved by the IFF and marked accordingly. i. This only includes on the rink during play. All tampering with the face mask, except painting, is prohibited. c) The goalkeeper may use any kind of protective equipment, but this must not include parts intended to cover the goal. i. Helmet and thin gloves are allowed. All forms of adhesives or friction checking substances are prohibited. No objects must be kept on or in the goal cage. 4) Particular team captain s equipment a) The team captain shall wear an armlet. i. The armlet shall be worn on the left arm and be clearly visible. Tape is not allowed as an armlet. 5) Personal equipment a) A player must not wear personal equipment which may cause injury. i. Personal equipment includes protective and medical equipment, watches, earrings, etc. The referees decide what shall be considered dangerous. All protective equipment shall, if possible, be worn underneath the clothing. With the exception of elastic headbands without knots, no headgear may be worn. All forms of long tights are prohibited for field players. 6) Ball ii. For any player requiring the use of prescription goggles or protective headgear; this must be constructed of soft material. a) The ball weighs 23 grams and its diameter is 72 mm. It has 26 holes in it; each of which is 11 mm in diameter and shall be approved by the IFF and marked accordingly. 7) Stick a) The stick shall be approved by the IFF and marked accordingly i. All tampering with the shaft, except shortening, is prohibited. The shaft may be strapped above the grip mark, but no official marks may be covered. b) The blade shall not be sharp and its hook shall not exceed 30 mm. i. All tampering with the blade, except hooking, is prohibited. The hook shall be measured as the distance between the highest point of the blade s inner side and an even surface on which the stick is lying. Changing the blade is allowed, but the new blade shall not be weakened. Taping the joint between the blade and the shaft is allowed, but no more than 10 mm of the visible part of the blade shall be covered. 8) The referees equipment a) The referees shall be equipped with plastic medium sized whistles, measuring equipment and red cards. 8 8 penalty has been committed by the attacking team in connection with, or immediately before the goal. c) The goal shall not be considered correctly scored if a field player in the attacking team intentionally kicks the ball immediately before it is directed into goal. If a player has scored with an incorrect stick and the mistake is noticed only after the ball has passed the goal line, the goal shall be allowed. d) When a player who is not noted in the match record, or is incorrectly numbered, is involved in the scoring of a goal. e) Involved implies scoring or assisting. 3) Incorrectly scored goals a) When a player in the attacking team has committed an offence leading to a free-hit or a penalty in connection with, or immediately before, the goal. (Prescribed offence sign) i. This includes when a team scores with too many players or a penalized player on the rink, and when a player in the attacking team intentionally moves the goal cage out of position. b) When a player in the attacking team intentionally directs the ball into goal with any part of his body. c) Since this is not considered an offence, play shall be resumed with a face-off. d) When the ball passes the goal line during, or after, a signal. e) A period or a match is over as soon as the final signal has started sounding. f) When the ball goes into the goal cage without passing the goal line from the front. g) When a goalkeeper throws or kicks the ball into the opposing team's goal, in an otherwise correct way. h) Since this is not considered an offence, play shall be resumed with a face-off. The ball has to touch another player or another player's equipment before it goes into goal. i) When a field player in the attacking team intentionally kicks the ball and it goes into goal after having touched another player or another player's equipment. j) Since this is not considered an offence, play shall be resumed with a face-off. k) When the offending team scores during a delayed penalty. l) The penalty shall be carried out and play resumed with a face-off. m) When the ball bounces off one of the referees and directly into goal v 6 Team Competition a. The Rink 1) Dimensions of the rink a) The rink shall be a minimum of 40 m x 20 m and enclosed by a board with rounded corners, which is approved by the IFF and marked accordingly. b) The rink shall be rectangular, the measures indicating length x width. The smallest rink allowed is 36 m x 18 m and the largest is 44 m x 22 m. 2) Markings on the rink a) All markings shall be made with lines, 4-5 cm in width, in a clearly visible color. b) A centre line and a centre spot shall be marked. 9 9 i) The centre line shall be parallel to the short sides of the rink and divide the rink into two halves of equal size. c) Goal creases measuring 4 m x 5 m shall be marked 2.85 m from the short sides of the rink. i) The goal creases shall be rectangular, and the measures indicate length x width including the lines. The goal creases shall be centred in relation to the long sides of the rink. d) Goalkeeper areas measuring 1 m x 2.5 m shall be marked 0.65 m in front of the rear limits of the goal creases. i) The goalkeeper areas shall be rectangular, and the measures indicate length x width including the lines. The goalkeeper areas shall be centred in relation to the long sides of the rink. e) The rear lines of the goalkeeper areas shall also serve as goal lines. Marks for the goal posts shall be made on the rear lines of the goalkeeper areas, so that the distance between the marks is 1.6 m. i) The goal lines shall be centred in relation to the long sides of the rink. The marks for the goal posts shall be made either with interruptions in the rear lines of the goalkeeper area or with short lines, perpendicular to the rear lines of the goalkeeper area. f) Face-off dots shall be marked on the centre line and on the imaginary extensions of the goal lines, 1.5 m from the long sides of the rink. i) The face-off dots shall be marked as crosses. The dots on the centre line may be imaginary. 3) Goal cages a) Goal cages, approved by the IFF and marked accordingly, shall be placed with the posts on the prescribed marks. b) The dimensions of the goal shall be 160 cm x 115 cm x 60 cm. c) The openings of the goal cages shall face the centre spot. 4) Substitution zones a) Substitution zones with a length of 10 m shall be marked along one of the long sides of the rink; 5 m from the centre line and include players benches. b) The substitution zones shall be marked on both sides of the board. The width of the substitution zones must not exceed 3 m, measured from the board. The players benches shall be placed at an appropriate distance from the board and have sufficient room for all members of team not on court, including coaches. 5) Secretariat and penalty benches a) A secretariat with penalty benches shall be placed opposite the substitution zones, by the centre line or based on best safe practice or available space in the venue. The secretariat and the penalty benches shall be placed at an appropriate distance from the board. There shall be separate penalty benches for each team, placed on each side of the secretariat. The penalty benches shall have room for at least two persons each. Exemption for the placing of the secretariat and the penalty benches may be given by the administrating authority. 6) Inspection of the rink a) The referees shall, at an early stage before the match, inspect the rink and ensure that defects are corrected. 10 10 b) All defects shall be reported. The arranging team is responsible for correcting defects and for keeping the board in a proper condition during the match. All dangerous objects shall be removed or padded. b. Participants 1) Allowable roster size is to be determined by the Competition Committee. At the Special Olympics World Games, the roster size may not exceed 12 players. 2) Players a) Each team is allowed to use a minimum of 8 players and a maximum of 12 players including two goalkeepers. These shall be noted in the match record. b) Players may be field players or goalkeepers. No other players than those noted in the match record are allowed to participate in the match or be in their own substitution zones. c) During play, at the most six players in each team, including only one goalkeeper, may be on the rink simultaneously. d) For the referees to start a match, each team shall have at least five field players and a properly equipped goalkeeper, or the final score shall be 5-0 to the non-offending team. During play, each team must be able to play with at least four players, or the match shall be stopped and the final score shall be 5-0 to the non-offending team, or the achieved result if this is more advantageous for the non-offending team. 3) Substitution of players a) Substitution of players may take place at any time and an unlimited number of times during a match. b) All substitution shall take place in the team s own substitution zone. A player leaving the rink has to be on his way passing over the board before a substitute may enter the rink. An injured player leaving the rink outside his own substitution zone must not be replaced until play is interrupted. 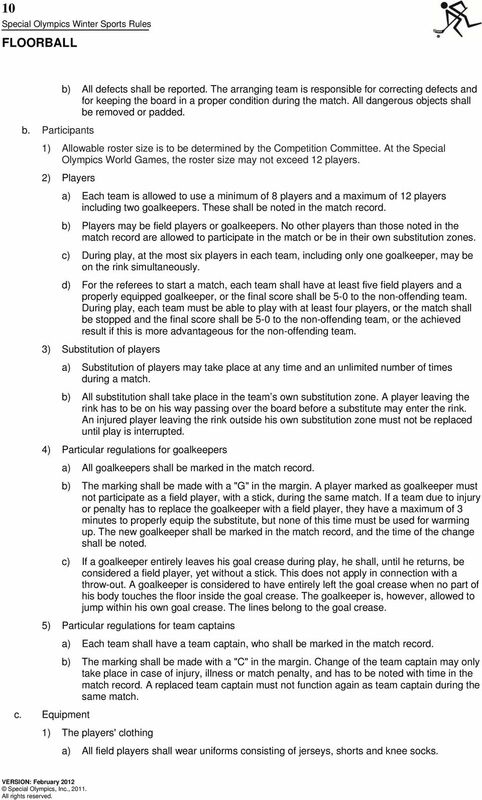 4) Particular regulations for goalkeepers a) All goalkeepers shall be marked in the match record. b) The marking shall be made with a "G" in the margin. A player marked as goalkeeper must not participate as a field player, with a stick, during the same match. If a team due to injury or penalty has to replace the goalkeeper with a field player, they have a maximum of 3 minutes to properly equip the substitute, but none of this time must be used for warming up. The new goalkeeper shall be marked in the match record, and the time of the change shall be noted. c) If a goalkeeper entirely leaves his goal crease during play, he shall, until he returns, be considered a field player, yet without a stick. This does not apply in connection with a throw-out. A goalkeeper is considered to have entirely left the goal crease when no part of his body touches the floor inside the goal crease. The goalkeeper is, however, allowed to jump within his own goal crease. The lines belong to the goal crease. 5) Particular regulations for team captains c. Equipment a) Each team shall have a team captain, who shall be marked in the match record. b) The marking shall be made with a "C" in the margin. Change of the team captain may only take place in case of injury, illness or match penalty, and has to be noted with time in the match record. A replaced team captain must not function again as team captain during the same match. 1) The players' clothing a) All field players shall wear uniforms consisting of jerseys, shorts and knee socks. 11 11 i. All field players in a team shall wear the exact same uniform. A team s uniform may have any color combination, but the jerseys must not be grey. If the referees consider that the teams can not be distinguished by their uniforms, the visiting team is obliged to change. The socks shall be pulled up to the knees, mutually uniform and, if decided by the administrating authority, distinguishable between the teams. b) All goalkeepers shall be dressed in jerseys and long trousers. c) All jerseys shall be numbered. i. A team s jerseys shall be numbered with different whole numbers in clearly visible Arabic figures on the back and on the chest. The back figures shall be at least 200 mm high and the chest figures at least 70 mm high. The jerseys may carry any number between 1 and 99 inclusive, but 1 is not allowed for field players. d) All players shall wear shoes. i. The shoes shall be of an indoor sports model. Socks outside the shoes are not allowed. If a player loses one or both shoes during play, he may continue playing until the next interruption. 2) The referees' clothing a) The referees shall wear jerseys, black shorts and black knee socks. b) The referees shall wear the same color combination on their uniform. 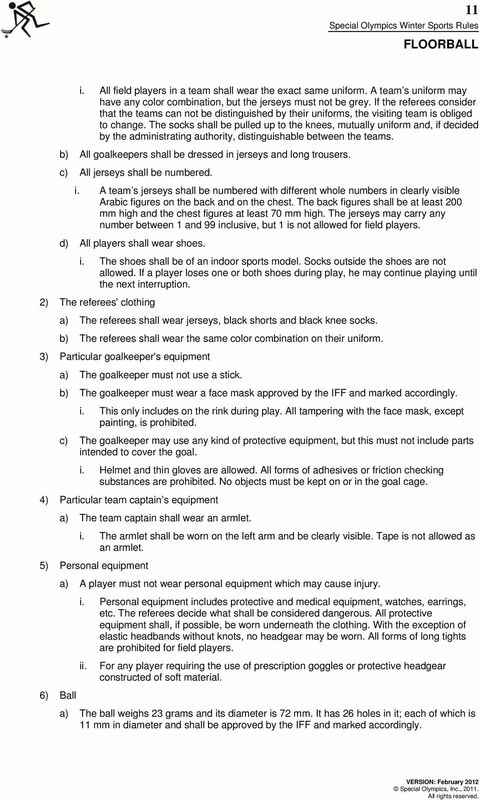 3) Particular goalkeeper's equipment a) The goalkeeper must not use a stick. b) The goalkeeper must wear a face mask approved by the IFF and marked accordingly. i. This only includes on the rink during play. All tampering with the face mask, except painting, is prohibited. c) The goalkeeper may use any kind of protective equipment, but this must not include parts intended to cover the goal. i. Helmet and thin gloves are allowed. All forms of adhesives or friction checking substances are prohibited. No objects must be kept on or in the goal cage. 4) Particular team captain s equipment a) The team captain shall wear an armlet. i. The armlet shall be worn on the left arm and be clearly visible. Tape is not allowed as an armlet. 5) Personal equipment a) A player must not wear personal equipment which may cause injury. i. Personal equipment includes protective and medical equipment, watches, earrings, etc. The referees decide what shall be considered dangerous. All protective equipment shall, if possible, be worn underneath the clothing. With the exception of elastic headbands without knots, no headgear may be worn. All forms of long tights are prohibited for field players. 6) Ball ii. For any player requiring the use of prescription goggles or protective headgear constructed of soft material. a) The ball weighs 23 grams and its diameter is 72 mm. It has 26 holes in it; each of which is 11 mm in diameter and shall be approved by the IFF and marked accordingly. 12 12 7) Stick a) The stick shall be approved by the IFF and marked accordingly i. All tampering with the shaft, except shortening, is prohibited. The shaft may be strapped above the grip mark, but no official marks may be covered. b) The blade shall not be sharp and its hook shall not exceed 30 mm. i. All tampering with the blade, except hooking, is prohibited. The hook shall be measured as the distance between the highest point of the blade s inner side and an even surface on which the stick is lying. Changing the blade is allowed, but the new blade shall not be weakened. Taping the joint between the blade and the shaft is allowed, but no more than 10 mm of the visible part of the blade shall be covered. 8) The referees equipment a) The referees shall be equipped with plastic medium sized whistles, measuring equipment and red cards. i. Exemption for other types of whistles may be given by the administrating authority. 9) The secretariat s equipment a) The secretariat shall have all the equipment necessary for their responsibilities. 10) Control of equipment a) The referees shall decide about controlling and measuring all equipment. i. Inspection shall take place before and during the match. Incorrect equipment, including defective sticks, discovered before the match shall be corrected by the player concerned, who after this may start the match. With the exception of personal equipment and minor defects to the stick (e.g. small holes or painting, which shall be corrected by the player concerned, who after this may continue the match), all incorrect equipment discovered during the match shall lead to the prescribed penalty. ii. 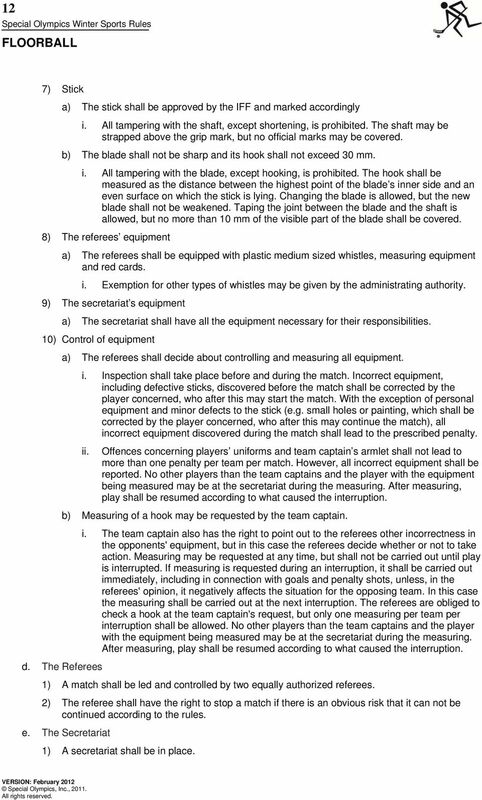 Offences concerning players uniforms and team captain s armlet shall not lead to more than one penalty per team per match. However, all incorrect equipment shall be reported. No other players than the team captains and the player with the equipment being measured may be at the secretariat during the measuring. After measuring, play shall be resumed according to what caused the interruption. b) Measuring of a hook may be requested by the team captain. i. The team captain also has the right to point out to the referees other incorrectness in the opponents' equipment, but in this case the referees decide whether or not to take action. Measuring may be requested at any time, but shall not be carried out until play is interrupted. If measuring is requested during an interruption, it shall be carried out immediately, including in connection with goals and penalty shots, unless, in the referees' opinion, it negatively affects the situation for the opposing team. In this case the measuring shall be carried out at the next interruption. The referees are obliged to check a hook at the team captain's request, but only one measuring per team per interruption shall be allowed. No other players than the team captains and the player with the equipment being measured may be at the secretariat during the measuring. After measuring, play shall be resumed according to what caused the interruption. d. The Referees 1) A match shall be led and controlled by two equally authorized referees. 2) The referee shall have the right to stop a match if there is an obvious risk that it can not be continued according to the rules. e. The Secretariat 1) A secretariat shall be in place. 13 13 2) The secretariat shall be neutral and responsible for the match record, time keeping and possible speaker tasks f. Duration of the game 1) Regular game time a) Regular game time shall be 3 x 20 minutes with two 10 minute intermissions when the team changes ends. This may vary based on schedule of games or number of teams in a tournament. i. Exemption for shorter game time however not less than 3 x 15 minutes and/or intermissions may be given by the administrating authority. When changing ends, the teams shall also change substitution zones. The home team shall choose ends at an early stage before the match. Every new period shall start with a face-off at the centre spot. At the end of every period the secretariat is responsible for providing a siren or other suitable sound device, unless this is automatic. The timing of the intermission shall start immediately at the end of the period. The teams are responsible for being back onto the rink in time to resume play after the intermission. If the referees consider one end of the rink to be better, the teams shall change ends after half the third period, but this has to be decided before the start of the third period. If such a changing of ends takes place, play shall be resumed with a face-off at the centre spot. b) Game time shall be effective however depending on venue being used or number of games being played simultaneously a running clock would be preferable to help with scheduling etc. i. Effective game time implies that time shall be stopped whenever play is interrupted by the referees whistle, and started again when the ball is played. ii. At unnatural game interruptions a triple signal shall be used. The referees decide what shall be regarded as an unnatural interruption, but this always includes: a damaged ball, the board coming apart, injuries, measuring of equipment, unauthorised persons or objects on the rink, the lights going out either completely or partly, and the final signal being sounded by mistake. iii. Should the board come apart play shall not be interrupted until the ball is near the place in question. In case of injuries play shall be interrupted only on suspicion of serious injury or if the injured player directly affects play. 2) Time out iv. An administrating authority may grant an exemption to use non-effective time, in which case game time shall only be stopped in connection with a goal, a penalty, a penalty shot, a time out or at the referees triple signal at an unnatural interruption. The last 3 minutes of regular game time shall always be effective. v. Game time shall be stopped during a penalty shot. a) During regular game time, each team shall have the right to request one time out, which shall be carried out, and be marked by a triple signal, as soon as play is interrupted. i. A time out may be requested at any time, including in connection with goals and penalty shots, but only by the team captain or a member of the team staff. A time out requested during an interruption shall be carried out immediately, but if the referees consider that this negatively affects the situation for the opposing team, the time out shall be carried out at the next interruption. A requested time out shall always be carried out, except after a goal, when the team may withdraw the request. A time out starts at the referees' additional signal when the teams are at their substitution zones and the referees at the secretariat. Another additional signal after 30 seconds marks the end of the time out. After a time out, play shall be resumed according to what caused the interruption. A penalized player must not participate in a time out. 14 14 3) Extra time a) If a match, that has to be decided, ends with a tie, it shall be extended to a maximum extra time of 5 minutes. 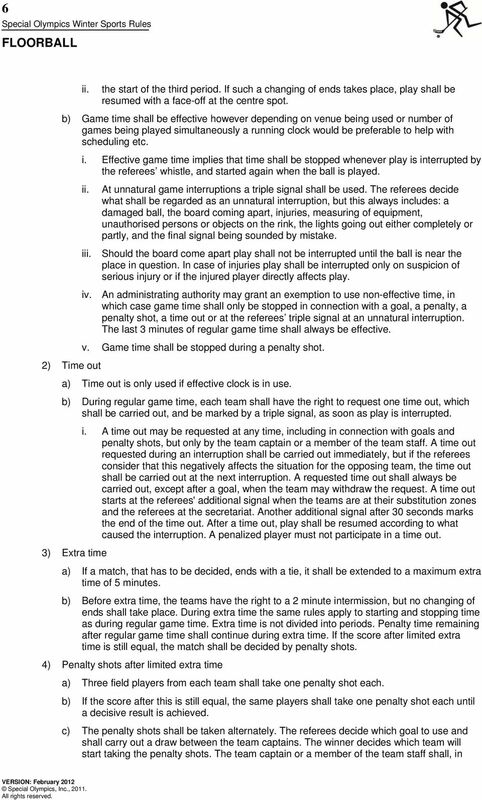 b) Before extra time, the teams have the right to a 2 minute intermission, but no changing of ends shall take place. 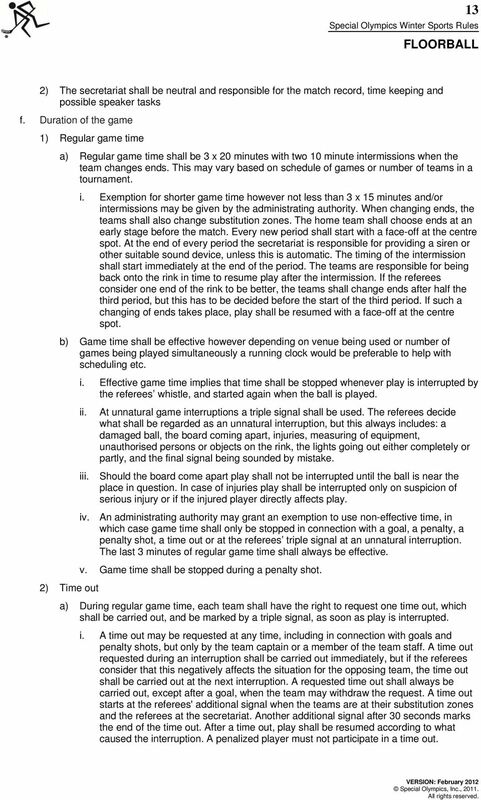 During extra time the same rules apply to starting and stopping time as during regular game time. Extra time is not divided into periods. Penalty time remaining after regular game time shall continue during extra time. If the score after limited extra time is still equal, the match shall be decided by penalty shots. 4) Penalty shots after limited extra time a) Five field players from each team shall take one penalty shot each. b) If the score after this is still equal, the same players shall take one penalty shot each until a decisive result is achieved. c) The penalty shots shall be taken alternately. The referees decide which goal to use and shall carry out a draw between the team captains. The winner decides which team will start taking the penalty shots. The team captain or a member of the team staff shall, in writing, inform the referees and the secretariat of the numbers of the players and the order in which they will take the penalty shots. The referees are responsible for ensuring that the penalty shots are taken in the exact order as noted by the team staff. d) As soon as a decisive result is achieved during the penalty shots, the match is over and the winning team shall be considered to have won by one extra goal. During the regular penalty shots, a decisive result is considered to be achieved when a team is leading by a larger number of goals than the opposing team has remaining penalty shots. During the possible extra penalty shots, a decisive result is considered to be achieved when a team has scored one goal more than the opposing team and both teams have taken the same number of penalty shots. 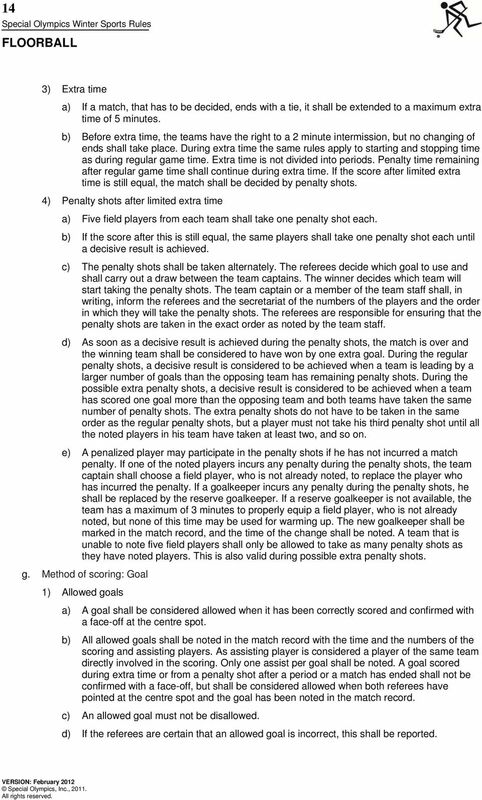 The extra penalty shots do not have to be taken in the same order as the regular penalty shots, but a player must not take his third penalty shot until all the noted players in his team have taken at least two, and so on. e) A penalized player may participate in the penalty shots if he has not incurred a match penalty. If one of the noted players incurs any penalty during the penalty shots, the team captain shall choose a field player, who is not already noted, to replace the player who has incurred the penalty. If a goalkeeper incurs any penalty during the penalty shots, he shall be replaced by the reserve goalkeeper. If a reserve goalkeeper is not available, the team has a maximum of 3 minutes to properly equip a field player, who is not already noted, but none of this time may be used for warming up. The new goalkeeper shall be marked in the match record, and the time of the change shall be noted. A team that is unable to note five field players shall only be allowed to take as many penalty shots as they have noted players. This is also valid during possible extra penalty shots. g. Method of scoring: Goal 1) Allowed goals a) A goal shall be considered allowed when it has been correctly scored and confirmed with a face-off at the centre spot. b) All allowed goals shall be noted in the match record with the time and the numbers of the scoring and assisting players. As assisting player is considered a player of the same team directly involved in the scoring. Only one assist per goal shall be noted. A goal scored during extra time or from a penalty shot after a period or a match has ended shall not be confirmed with a face-off, but shall be considered allowed when both referees have pointed at the centre spot and the goal has been noted in the match record. 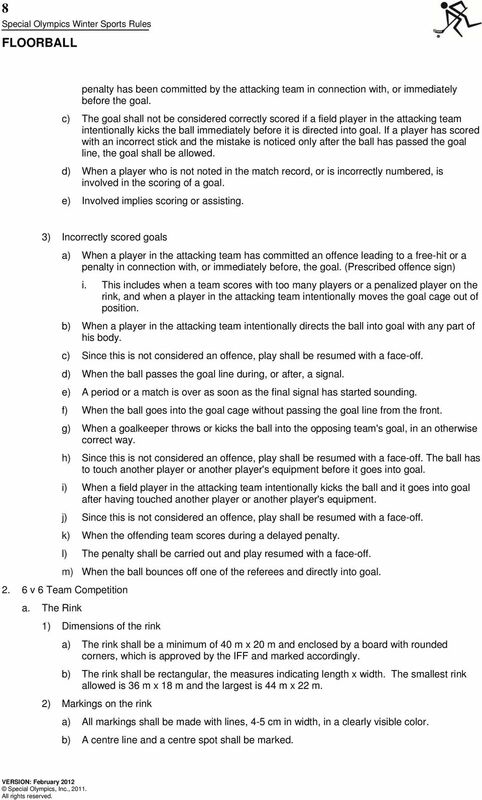 c) An allowed goal must not be disallowed. d) If the referees are certain that an allowed goal is incorrect, this shall be reported. 15 15 2) Correctly scored goals a) When the entire ball passes the goal line from the front, having been played in a correct way with a field player's stick, and no offence leading to a free-hit or a penalty has been committed by the attacking team in connection with, or immediately before, the goal. This includes: i. When a player in the defending team has moved the goal cage out of position and the ball passes the goal line from the front between the marks for the posts and below the imaginary position of the bar. ii. When an own goal is scored. An own goal may be allowed off the stick or body of the defender. 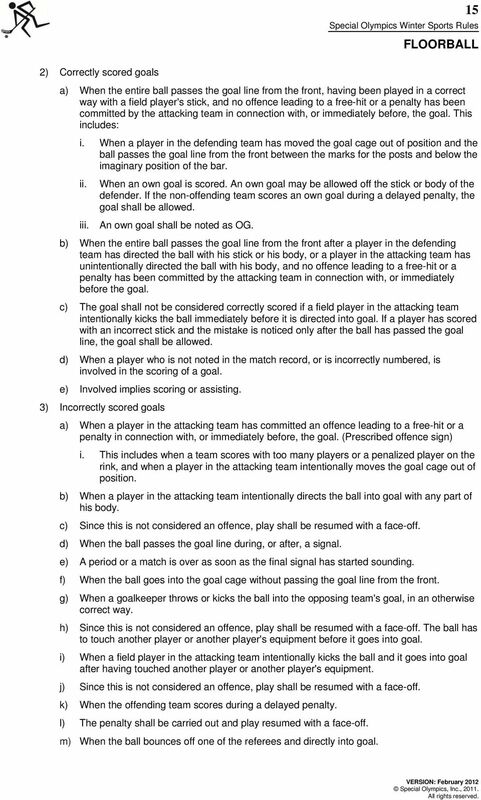 If the non-offending team scores an own goal during a delayed penalty, the goal shall be allowed. iii. An own goal shall be noted as OG. b) When the entire ball passes the goal line from the front after a player in the defending team has directed the ball with his stick or his body, or a player in the attacking team has unintentionally directed the ball with his body, and no offence leading to a free-hit or a penalty has been committed by the attacking team in connection with, or immediately before the goal. c) The goal shall not be considered correctly scored if a field player in the attacking team intentionally kicks the ball immediately before it is directed into goal. If a player has scored with an incorrect stick and the mistake is noticed only after the ball has passed the goal line, the goal shall be allowed. d) When a player who is not noted in the match record, or is incorrectly numbered, is involved in the scoring of a goal. e) Involved implies scoring or assisting. 3) Incorrectly scored goals a) When a player in the attacking team has committed an offence leading to a free-hit or a penalty in connection with, or immediately before, the goal. (Prescribed offence sign) i. This includes when a team scores with too many players or a penalized player on the rink, and when a player in the attacking team intentionally moves the goal cage out of position. b) When a player in the attacking team intentionally directs the ball into goal with any part of his body. c) Since this is not considered an offence, play shall be resumed with a face-off. d) When the ball passes the goal line during, or after, a signal. e) A period or a match is over as soon as the final signal has started sounding. f) When the ball goes into the goal cage without passing the goal line from the front. g) When a goalkeeper throws or kicks the ball into the opposing team's goal, in an otherwise correct way. h) Since this is not considered an offence, play shall be resumed with a face-off. The ball has to touch another player or another player's equipment before it goes into goal. i) When a field player in the attacking team intentionally kicks the ball and it goes into goal after having touched another player or another player's equipment. j) Since this is not considered an offence, play shall be resumed with a face-off. k) When the offending team scores during a delayed penalty. l) The penalty shall be carried out and play resumed with a face-off. m) When the ball bounces off one of the referees and directly into goal. 17 17 v. enter the rink when the penalty expires. The referees shall together with the secretariat help a goalkeeper, whose penalty has expired during play, to leave the penalty bench as soon as play is interrupted. d) Penalty time shall be synchronized to game time. 2) Bench penalty a) A bench penalty shall affect the team, and due to this the penalized player must not be replaced on the rink during the penalty. 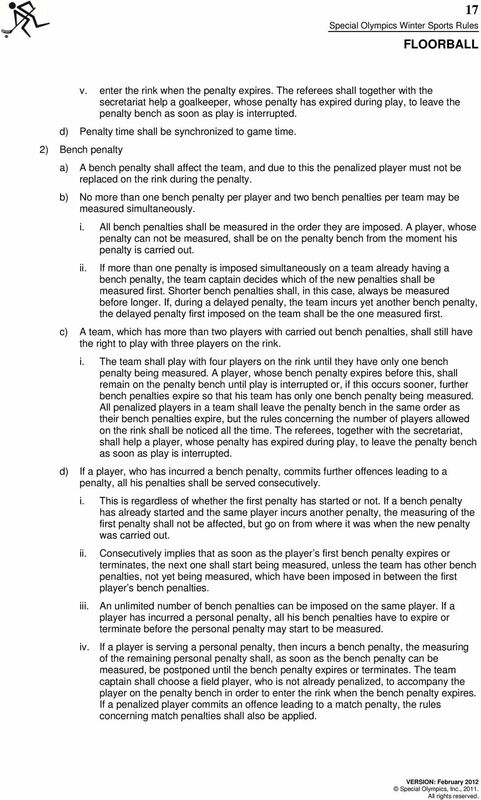 b) No more than one bench penalty per player and two bench penalties per team may be measured simultaneously. i. All bench penalties shall be measured in the order they are imposed. A player, whose penalty can not be measured, shall be on the penalty bench from the moment his penalty is carried out. ii. 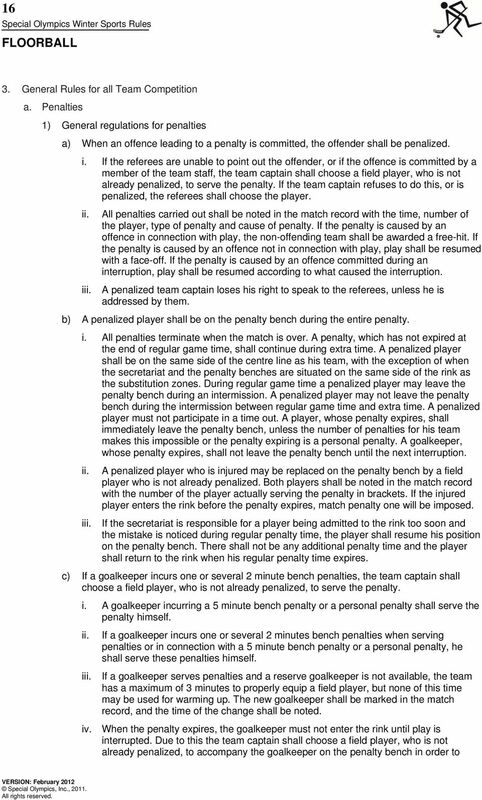 If more than one penalty is imposed simultaneously on a team already having a bench penalty, the team captain decides which of the new penalties shall be measured first. Shorter bench penalties shall, in this case, always be measured before longer. If, during a delayed penalty, the team incurs yet another bench penalty, the delayed penalty first imposed on the team shall be the one measured first. c) A team, which has more than two players with carried out bench penalties, shall still have the right to play with three players on the rink. i. The team shall play with four players on the rink until they have only one bench penalty being measured. A player, whose bench penalty expires before this, shall remain on the penalty bench until play is interrupted or, if this occurs sooner, further bench penalties expire so that his team has only one bench penalty being measured. All penalized players in a team shall leave the penalty bench in the same order as their bench penalties expire, but the rules concerning the number of players allowed on the rink shall be noticed all the time. The referees, together with the secretariat, shall help a player, whose penalty has expired during play, to leave the penalty bench as soon as play is interrupted. d) If a player, who has incurred a bench penalty, commits further offences leading to a penalty, all his penalties shall be served consecutively. i. This is regardless of whether the first penalty has started or not. If a bench penalty has already started and the same player incurs another penalty, the measuring of the first penalty shall not be affected, but go on from where it was when the new penalty was carried out. ii. iii. Consecutively implies that as soon as the player s first bench penalty expires or terminates, the next one shall start being measured, unless the team has other bench penalties, not yet being measured, which have been imposed in between the first player s bench penalties. An unlimited number of bench penalties can be imposed on the same player. If a player has incurred a personal penalty, all his bench penalties have to expire or terminate before the personal penalty may start to be measured. iv. If a player is serving a personal penalty, then incurs a bench penalty, the measuring of the remaining personal penalty shall, as soon as the bench penalty can be measured, be postponed until the bench penalty expires or terminates. The team captain shall choose a field player, who is not already penalized, to accompany the player on the penalty bench in order to enter the rink when the bench penalty expires. If a penalized player commits an offence leading to a match penalty, the rules concerning match penalties shall also be applied. 18 18 3) 2 minute bench penalty a) If the opposing team scores during a 2 minute bench penalty that is being measured, the penalty shall terminate, unless the opposing team is outnumbered on the rink or the teams play with equal strength. i. 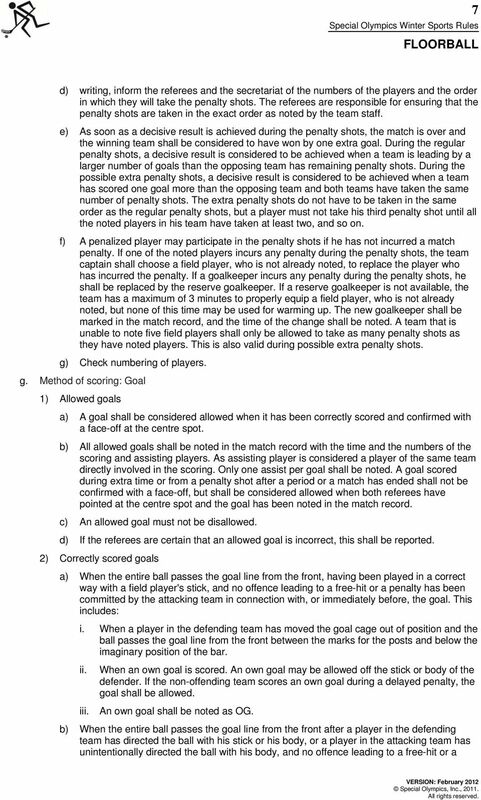 The penalty will not terminate if the goal is scored neither during a delayed penalty nor from a penalty shot caused by an offence leading to a penalty. If a 2 minute bench penalty is imposed in connection with a penalty shot or a delayed penalty shot, the rules concerning penalties in connection with a penalty shot shall also be applied. b) If a team has more than one 2 minute bench penalty, these shall terminate in the same order they have been carried out. 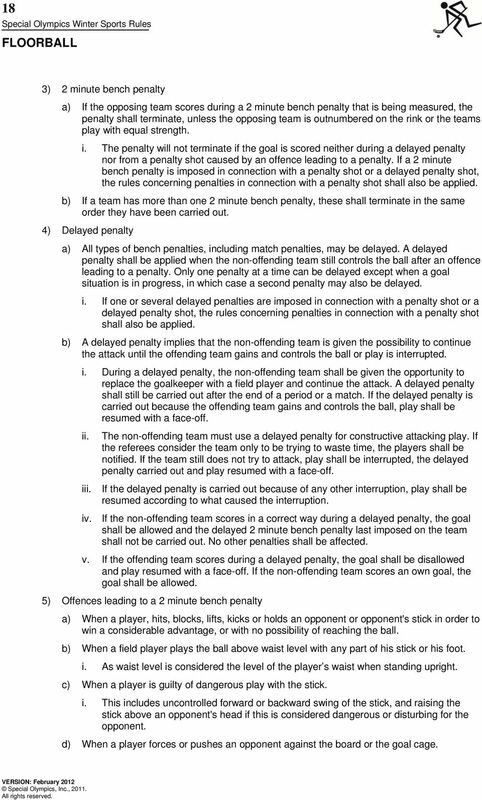 4) Delayed penalty a) All types of bench penalties, including match penalties, may be delayed. A delayed penalty shall be applied when the non-offending team still controls the ball after an offence leading to a penalty. Only one penalty at a time can be delayed except when a goal situation is in progress, in which case a second penalty may also be delayed. i. If one or several delayed penalties are imposed in connection with a penalty shot or a delayed penalty shot, the rules concerning penalties in connection with a penalty shot shall also be applied. b) A delayed penalty implies that the non-offending team is given the possibility to continue the attack until the offending team gains and controls the ball or play is interrupted. i. During a delayed penalty, the non-offending team shall be given the opportunity to replace the goalkeeper with a field player and continue the attack. A delayed penalty shall still be carried out after the end of a period or a match. If the delayed penalty is carried out because the offending team gains and controls the ball, play shall be resumed with a face-off. ii. iii. The non-offending team must use a delayed penalty for constructive attacking play. If the referees consider the team only to be trying to waste time, the players shall be notified. If the team still does not try to attack, play shall be interrupted, the delayed penalty carried out and play resumed with a face-off. If the delayed penalty is carried out because of any other interruption, play shall be resumed according to what caused the interruption. iv. 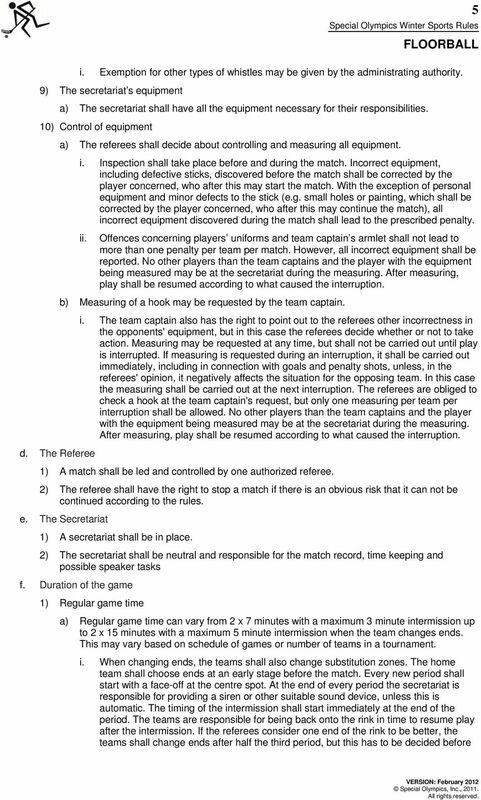 If the non-offending team scores in a correct way during a delayed penalty, the goal shall be allowed and the delayed 2 minute bench penalty last imposed on the team shall not be carried out. No other penalties shall be affected. v. If the offending team scores during a delayed penalty, the goal shall be disallowed and play resumed with a face-off. If the non-offending team scores an own goal, the goal shall be allowed. 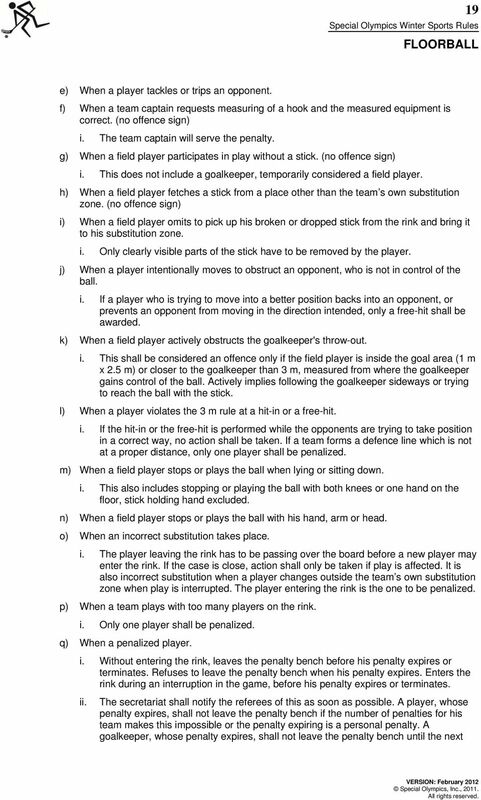 5) Offences leading to a 2 minute bench penalty a) When a player, hits, blocks, lifts, kicks or holds an opponent or opponent's stick in order to win a considerable advantage, or with no possibility of reaching the ball. b) When a field player plays the ball above waist level with any part of his stick or his foot. i. As waist level is considered the level of the player s waist when standing upright. c) When a player is guilty of dangerous play with the stick. i. This includes uncontrolled forward or backward swing of the stick, and raising the stick above an opponent's head if this is considered dangerous or disturbing for the opponent. d) When a player forces or pushes an opponent against the board or the goal cage. 20 20 iii. interruption. If a penalized player enters the rink during play, this is considered sabotage of the game. r) When a player commits repeated offences leading to a free-hit. i. This includes both shorter and longer time. s) When a team systematically disrupts play by committing repeated offences leading to a free-hit. i. This also includes when a team commits a number of minor offences during a short time. The player committing the last offence shall serve the penalty. t) When a player intentionally delays play. i. This includes when a player of the offending team is striking or taking the ball away when play is interrupted, intentionally blocking the ball against the board or a goal or intentionally damaging the ball. u) When a team systematically delays play. i. If the referees consider a team close to being penalized for delaying play, the team captain shall, if possible, be notified before any action is taken. The team captain shall choose a field player, who is not already penalized, to serve the penalty. v) When a player or a member of the team staff protests against the referees' decisions, or when coaching is performed in a disturbing or otherwise incorrect way. i. This includes when the team captain constantly and without reason questions the referees' decisions. ii. Protesting against the referees decisions and coaching in a disturbing way is considered spontaneous and a minor offence compared to unsportsmanlike behavior. iii. This also applies if a member of the team staff enters the rink without the referees permission. The referee shall, if possible, notify the team staff before any action is taken. w) When a goalkeeper, despite summons from the referees, omits to put the goal cage back into position. i. It is the goalkeeper s responsibility to put the goal cage back as soon as this is considered possible. x) When a player, despite summons from the referees, omits to correct his personal equipment (no offence sign). y) When a player uses incorrect clothing (no offence sign). i. This includes missing parts of the clothing and offences concerning the team captain s armlet. ii. 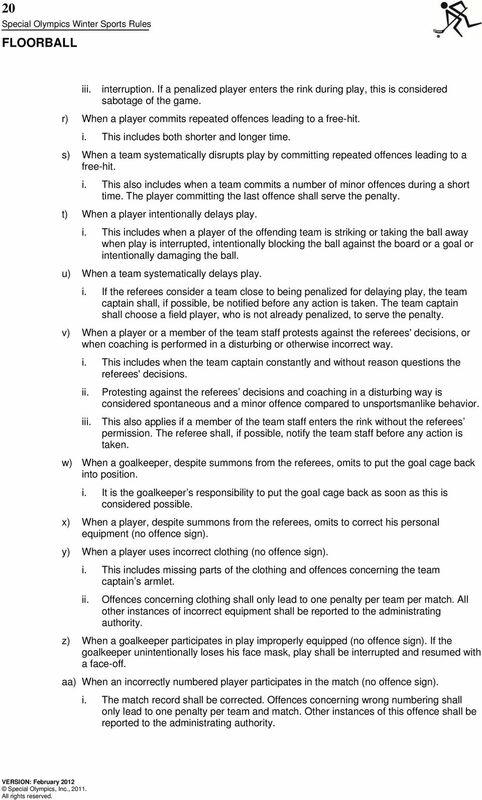 Offences concerning clothing shall only lead to one penalty per team per match. All other instances of incorrect equipment shall be reported to the administrating authority. z) When a goalkeeper participates in play improperly equipped (no offence sign). If the goalkeeper unintentionally loses his face mask, play shall be interrupted and resumed with a face-off. aa) When an incorrectly numbered player participates in the match (no offence sign). i. The match record shall be corrected. Offences concerning wrong numbering shall only lead to one penalty per team and match. Other instances of this offence shall be reported to the administrating authority. SPORTS RULES: FLOOR HOCKEY The Official Special Olympics Rules shall govern all Special Olympics Floor Hockey competitions. Special Olympics, Inc. is the International Governing Body for Floor Hockey. INTERNATIONAL FEDERATION OF NETBALL ASSOCIATIONS The Official INF Rules of Netball (revised 2011) apply to all game situations not specifically mentioned in the Fast5 Rules of the Game within this document. Soccer-Tennis Rules. RULE 7 - BEGINNING THE GAME The winner of a coin toss is allowed to elect whether they will kick off or choose a side to defend. THE OFFICIAL RULES OF USA HOCKEY INLINE Typographer: Dana Ausec Illustrator: Mike Curti Front cover photo courtesy of USA Hockey InLine 2007 by USA Hockey InLine, a program of USA Hockey. All rights reserved. Under 8 Short Sided Game Rules Field Dimensions: The field of play shall be rectangular with the length no more than 70 yards or less than 50 yards and its width no more than 50 yards or less than 30 yards. Apparel/Clothing. Shin Guards: Shin guards may be worn by players. If they are worn, long athletic socks must be worn over the shin guards.